Our 150 Birthday celebrations will continue into the evening on Bank Holiday Monday 27 May, with a special ticketed event from 7pm. 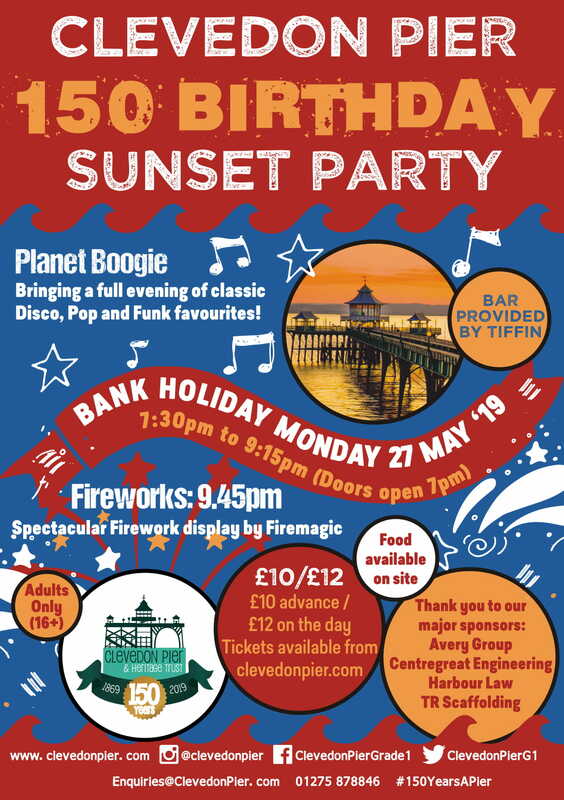 Local Pop, Funk and Disco band, Planet Boogie, will present an evening of music for you to enjoy as we celebrate this historic milestone of Clevedon Pier, as the sun goes down. With on-site caterer, Tiffin, providing a special bar at the end of the Pier Head, alongside a hot food concession. To finish the evening we will have a spectacular firework display, courtesy of FireMagic. Tickets £10 per person (16+) / (£12) on the day. 228 available	 150 Sunset Party £10.00 including VAT Adults only (16+).